Peony is a tattooed tattoo enthusiast who loves studying and discussing tattoo history and meanings. Japanese themes are her favorite. 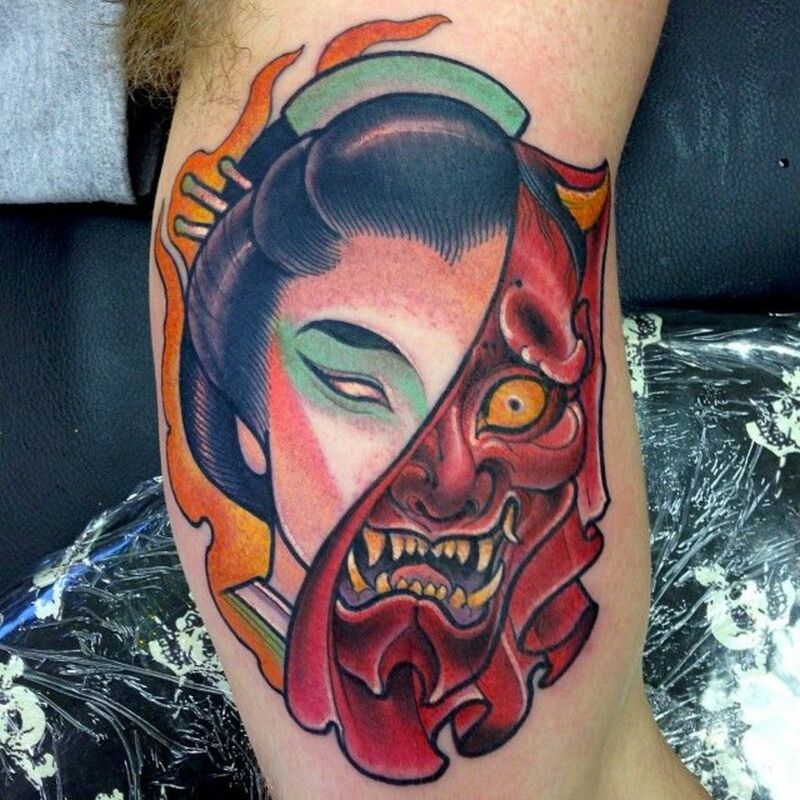 The Hannya is undisputedly one of the more popular subjects used in Japanese-themed tattoos. Designed with devil's horns, somber eyes, and a wide mouth, the mask looks terrifying, formidable, and full of character. Veiled behind that sinister sneer is a fascinating backstory and a couple of interesting tidbits you might not have known. Note: The Hannya is sometimes confused with oni mask tattoos and kabuki theater face painting. 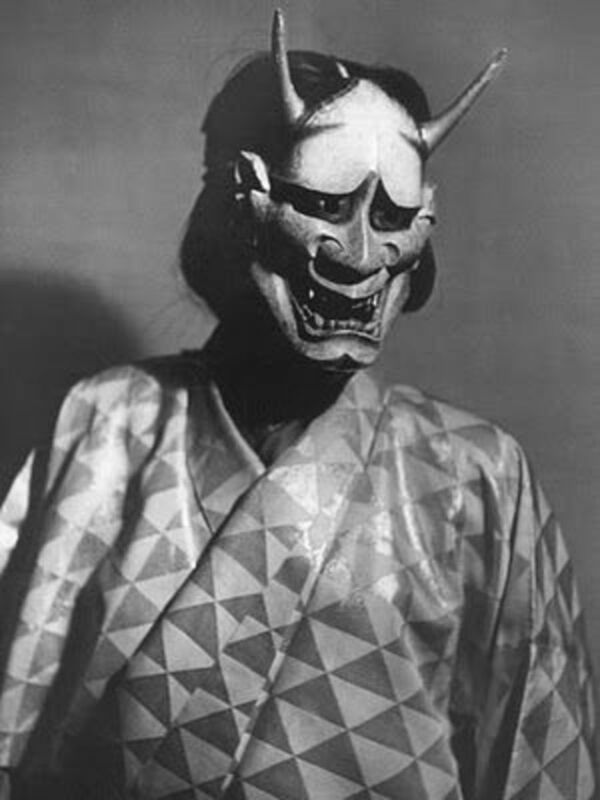 The Hannya mask is used in Japanese noh and kyōgen theater shows (classical musical performances based on Japanese folklore and the supernatural). The mask represents a tormented demon woman who is overtaken by jealousy and contempt. One of the most popular plays that utilized the Hannya mask tells the story of Prince Genji, who is married to Lady Aoi but has a mistress named Lady Rokujo. When his wife becomes pregnant, he ignores Lady Rokujo. As a result, Lady Rokujo turns into a jealous woman and is overcome with violent anger. She then turns into a demon and possesses the wife and kills her. Origin of the word "Hannya"
The word Hannya is thought to have come from the artist, Hannyabô, who carved this wooden mask. The design is believed to have been adapted from earlier serpent masks. Another theory is that “Hannya” comes from the word “Paññā/Prajñā” (般若), which means "wisdom" or "higher consciousness" in Japanese Buddhism. Because the mask was traditionally designed to change expressions depending on the angle at which it was viewed, a Hannya tattoo design could represent the different stages of emotion. Anger, Jealousy, Resentment: A Hannya tattoo indicates that the wearer is unforgiving. It is for this reason that the tattoo is so popular among the yakuza (the Japanese mafia). A Yakuza member who wears this wants people to know that he shows no mercy. Pure Evil: If the mask is painted red, it indicates that the woman has lost control of herself and has turned into a demon completely. 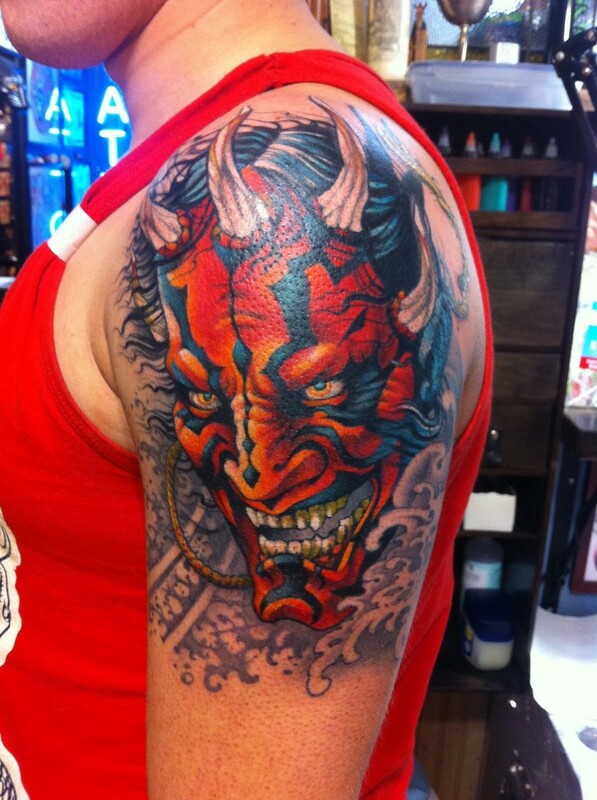 Someone who sports a red Hannya mask tattoo has probably gone too far over to the dark side. Passion and Love: The Hannya represents a woman that is overcome with intense and passionate emotions associated with love. The wearer might have had a history of unrequited love or betrayal. A Hannya tattoo could also represent someone who tends to give all of herself in a romantic relationship. Good Luck: In traditional Japanese culture, the Hannya symbol is used as a talisman to scare and ward off evil spirits and to bring good luck. Some superstitious people carry around a miniature Hannya mask on a keychain for protection, so getting a permanent Hannya tattoo on your body is a convenient way to take this talisman with you wherever you go. Judge of Good and Evil: The Hannya is the female version of the Oni (male demon). In Japanese folklore, the Oni punishes people by spreading disease. This may explain why the Hannya mask tattoo is popular among yakuza gang members as they often punish their enemies. 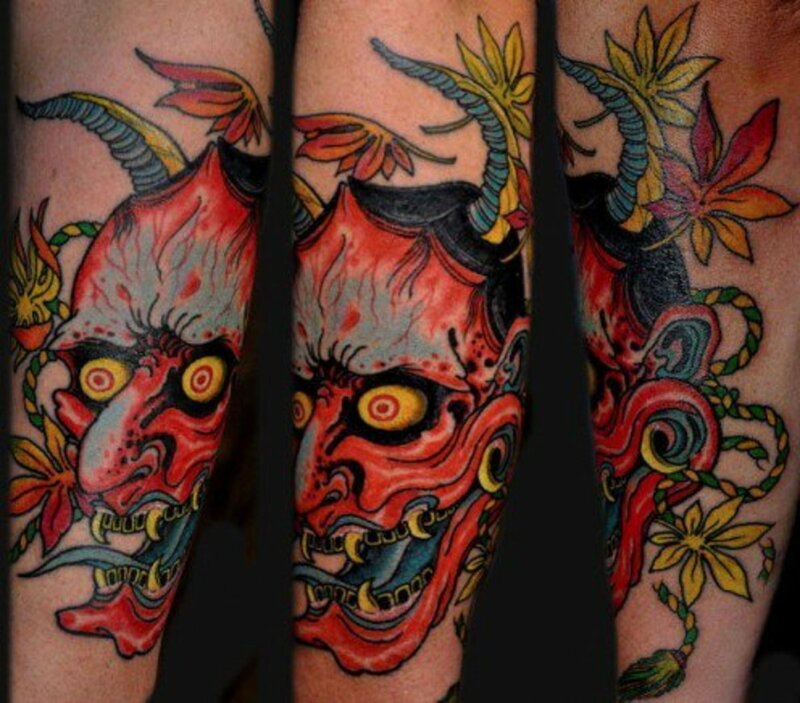 Wisdom: Because the word Hannya is a Japanese term for "wisdom," hannya mask tattoos are a reminder to the wearer to be prudent in their romantic relationships. Tormented Female Spirit: The Hannya is a symbol of the human struggle between good and bad—the Hannya is sad but becomes evil when she lets her sadness turn into resentful anger. The mask could be a representation of a woman who is perpetually haunted by emotional conflict. Haunted Past: If you have a memory that haunts you but serves as a valuable lesson, the Hannya tattoo could be a representation of that. Some people also believe that the Hannya could prevent the past from repeating itself. 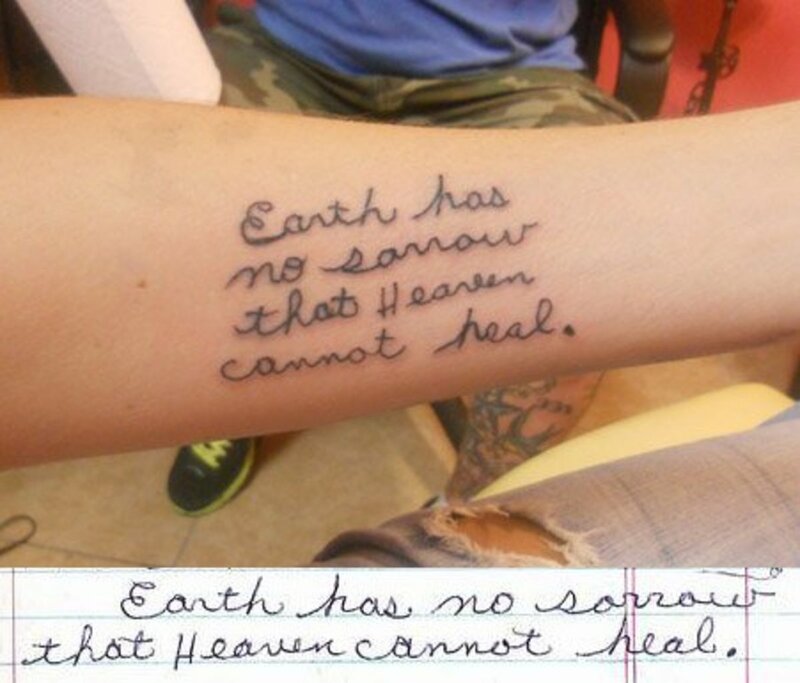 The tattoo could also symbolize a difficult and emotional period in your past that you have conquered. Theater: A performer of traditional Japanese plays might get this tattoo to symbolize their profession and love for theater and Japanese culture. You might have seen the Japanese Hannya mask in different colors. One belief is that the deeper the color of a Hannya mask, the angrier or more malicious it’s supposed to be. A Hannya mask with a lighter complexion means that the wearer is not yet a demon. The horns are usually smaller too. 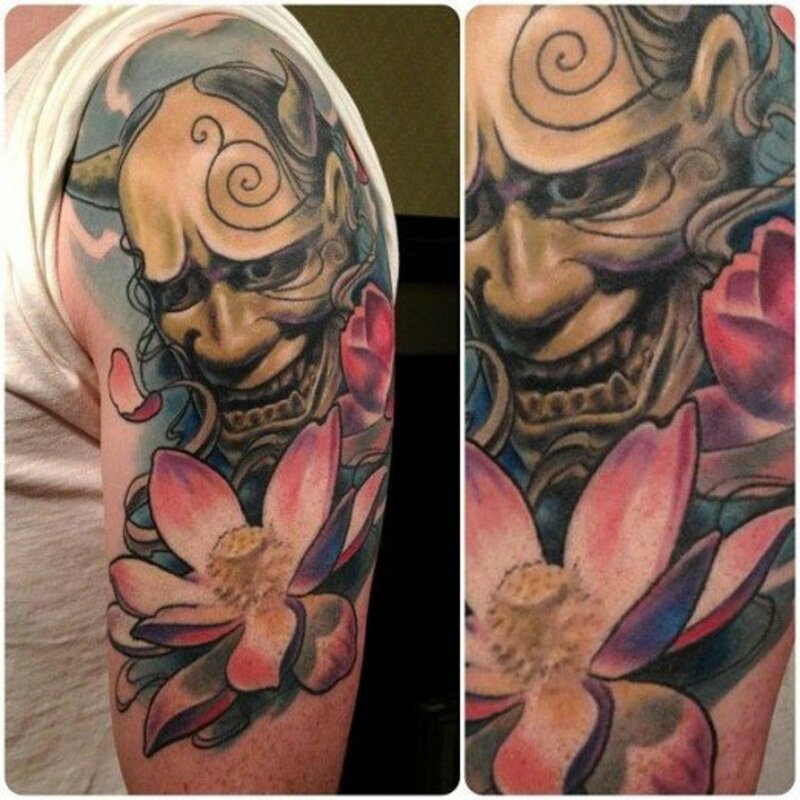 A lighter-colored Hannya tattoo means that the wearer is still human but is experiencing turmoil beneath the surface. A darker red represents someone who has already been through a hellish emotional past. A deep dark red is symbolic of someone who is filled with rage and is out for vengeance. Personally, I don't think the Hannya mask should be limited to just traditional colors. I've seen designs that range from the original white and red to blue, purple, green, yellow, black, or any other hue. 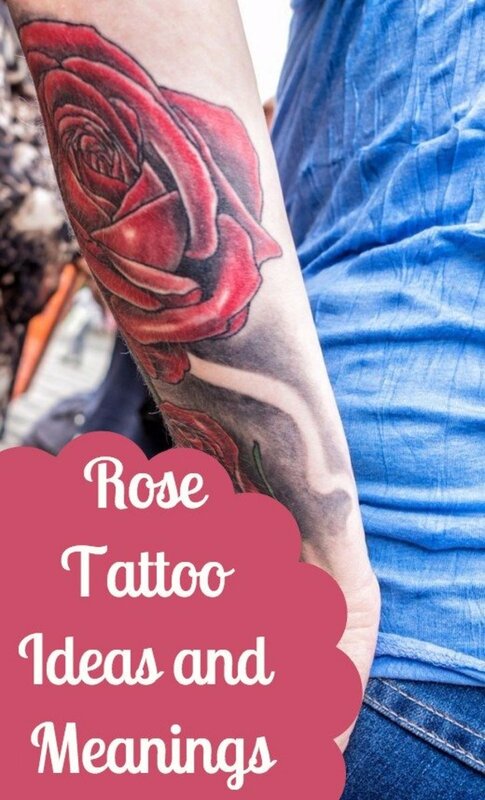 The most important thing is that the tattoo conveys the intended mood and fits with the general colors used in the whole tattoo. 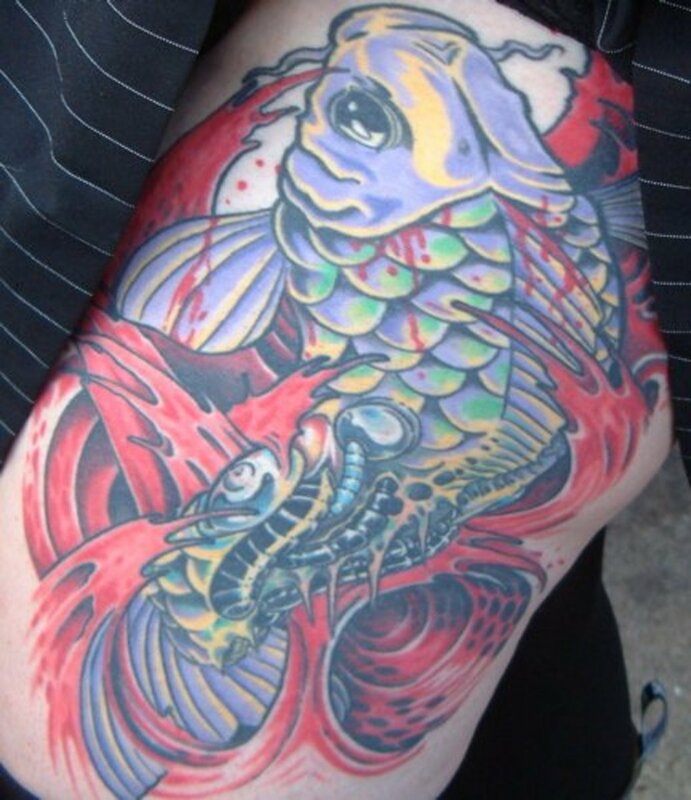 If you want a more traditional Hannya tattoo, then the colors can represent social rank. Regardless of where your preferred placement is, be it a sleeve tattoo, a back piece, a calf tattoo, or a hikae tattoo, figuring out the complexity of the design will determine the size you should allocate for your ink. 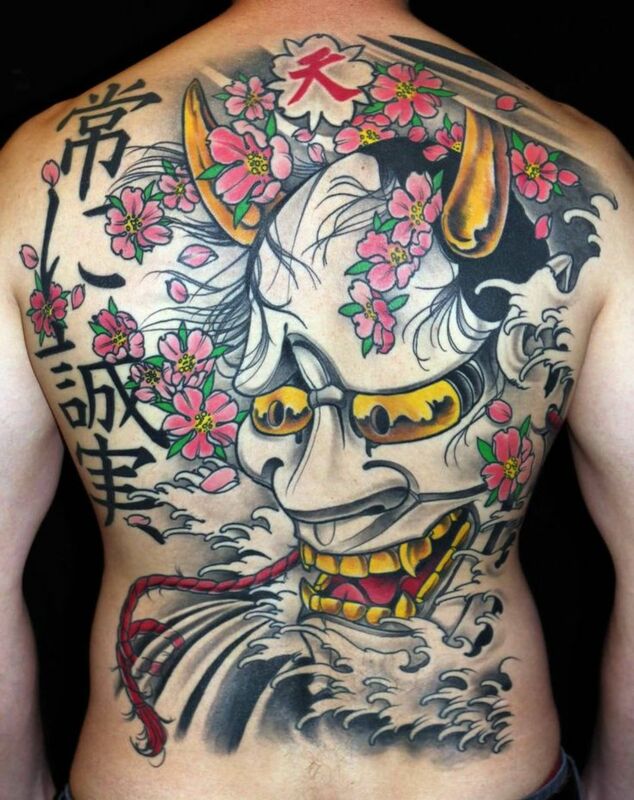 To have a very elaborate Hannya tattoo on a small area might cramp the overall design with too many things. Plan for the components you want and your artist should do the layout for you. Tidal Waves: Like the Hannya, waves are unpredictable. Both the Hannya and the wave can be destructive, but they can also have moments of calm solitude. Chrysanthemums: Flowers are popular designs that are often incorporated into tattoos of this Japanese devil mask. Because this flower blooms in fall, and fall is the season of change, a Hannya chrysanthemum tattoo represents an anguished person who desires to escape their emotional state. Sakuras/Cherry Blossom: Cherry blossoms represent life after death or illness. 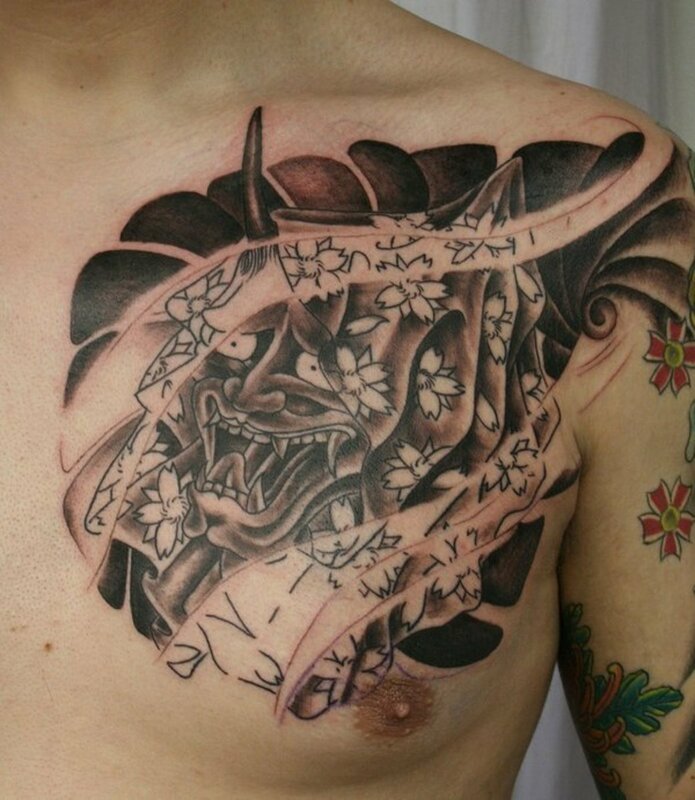 A Hannya cherry blossom tattoo is symbolic of achieving a better life after dealing with a tormented past. Maple Leaves: Leaves are symbolic of the cycle of life. The maple leaves and the mask could represent someone with an emotional past who hopes for a better future. Snake: This one is popular with the yakuza. In Japanese culture, the snake represents good luck and protection. In Ancient Japanese culture, the snake represented immortality. 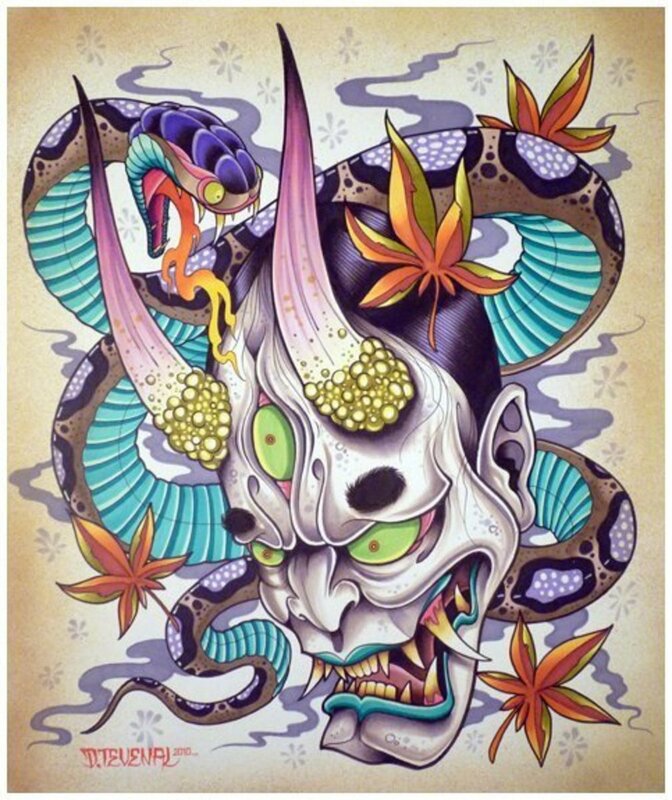 Hence, a snake Hannya mask tattoo could be a symbol of good luck, or it could mean that the wearer's rage will never die. Skull: The skull is a positive representation of the life cycle. It is usually used to honor the dead. It could also represent the underworld and a demonic life. Koi: Because the koi swims upstream, this fish represents bravery, strength, and determination. Portrayed positively, a Hannya koi tattoo symbolizes bravery in the face of situations that may cause one to become jealous and vengeful. In a more negative light, the koi and Hannya mask could be a sign that the wearer is determined to wreak havoc. Dragon: In Oriental culture, the dragon is a benevolent creature that uses its strength to do good. A dragon tattoo with a Hannya mask symbolizes the struggle between using your power for hateful vengeance and using it to do good. Geisha: The geisha represents feminine power and intrigue. She is an enigmatic entertainment figure and can only be appreciated by certain people; thus she also represents someone who is unattainable. 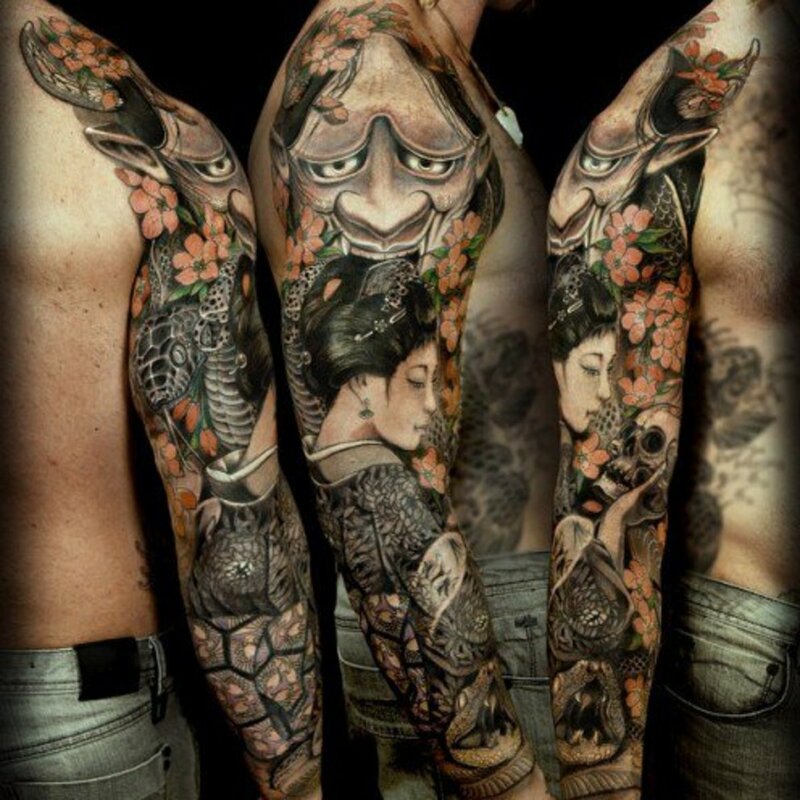 A Hannya mask and geisha tattoo represents a woman who is emotionally complex and unreachable. On a man, this combination could represent a woman in the man's life who has similar traits. Samurai: The samurai is a symbol of strength and discipline, while the Hannya is a symbol of uncontrolled behavior. This is a fascinating contrast of concepts for a tattoo and could represent the eternal struggle between restrained and mindful thinking and untethered emotions that can cause harm. 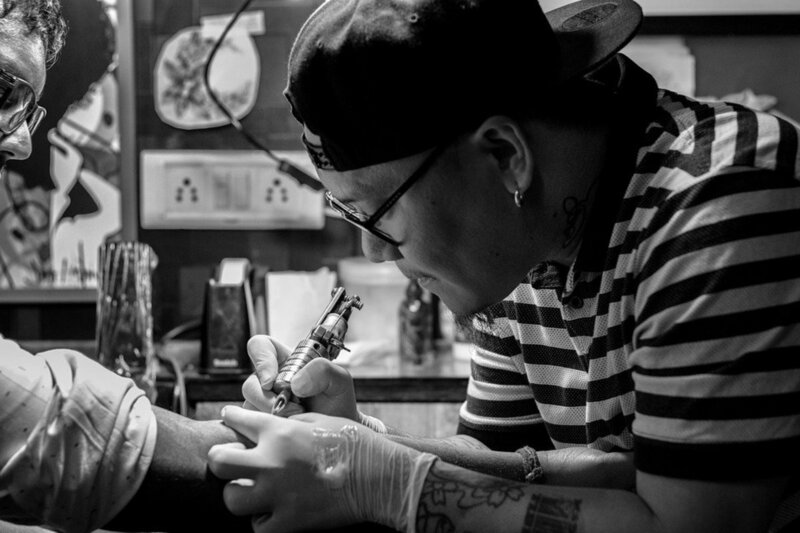 In Asian cultures, many tattooist don't fill in the eyes until the piece is near done.They believe that once you 'dot' the eye, the tattoo comes alive. 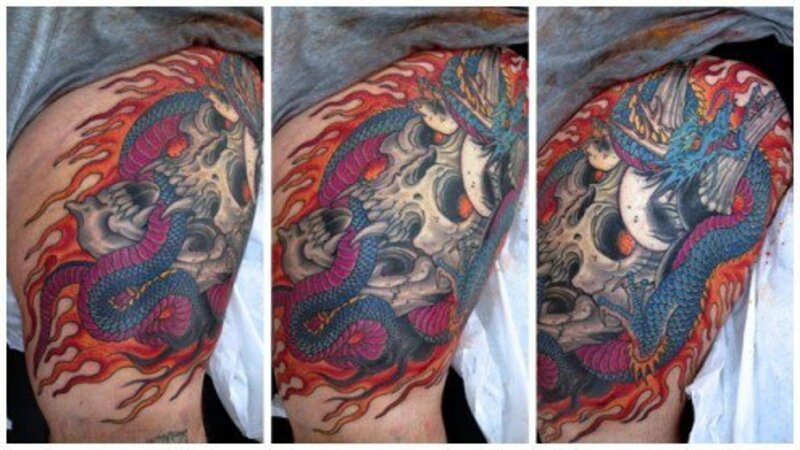 Besides traditional Hannya tattoos, which follow the irezumi style, many tattooists are injecting their personal twist. 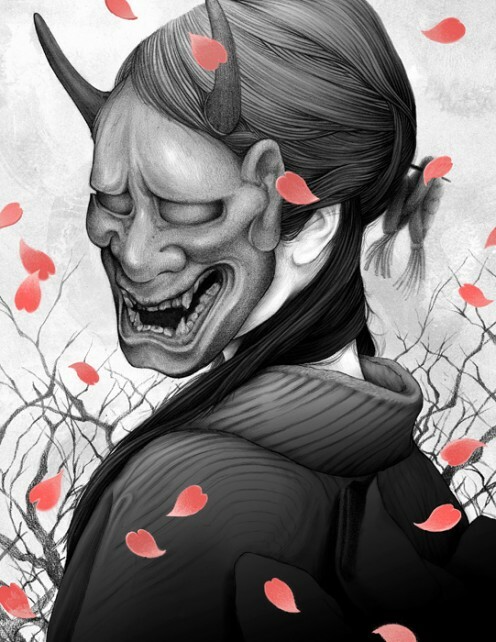 An example shown below preserves many of the Hannya masks' characteristics but also blends the illustrative style of Brothers Grimm's Fairy Tales. The oni mask represents a male demon. The hannya mask represents a female demon. What Does a Hannya Mask Look Like? 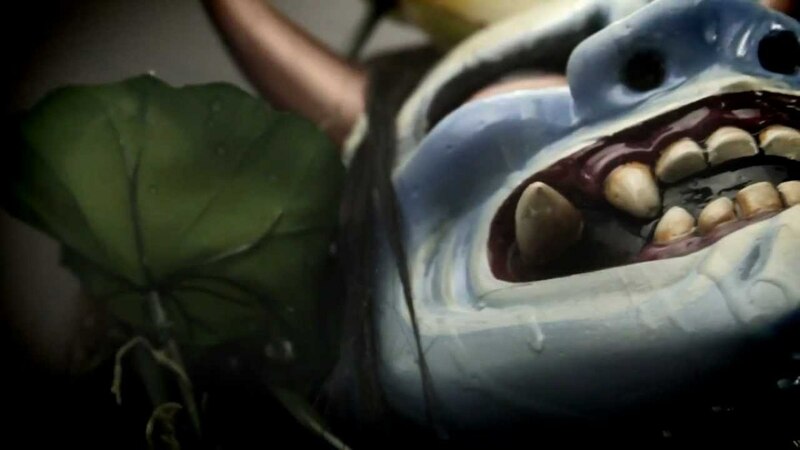 The Hannya mask is a compelling sight of disheveled hair, two sharp horns piercing through the temples, huge bulbous eyes, and fangs showing from a gaping mouth split ear to ear. It is the perfect imagery of evil. The mask often resembles a demon, but is sometimes portrayed as a dragon or serpent. Although the mask features a seemingly perpetual scowl, when viewed at different angles, the Hannya shows varied expressions. From the front, it looks menacing and filled with hatred. Tilted at an angle and viewed from the top, it appears forlorn and anguished—almost crying. These array of emotions reflect the complexities of the human psyche. The oldest Hannya mask dates back to the 1550s. Yoshimitsu, from the game Tekken, wears a Hannya mask. In Naruto, the Prajñā Group (Hannya Black Ops) is a part of the Anbu of the Land of Woods. They were eventually annihilated after they betrayed Konona-nin. 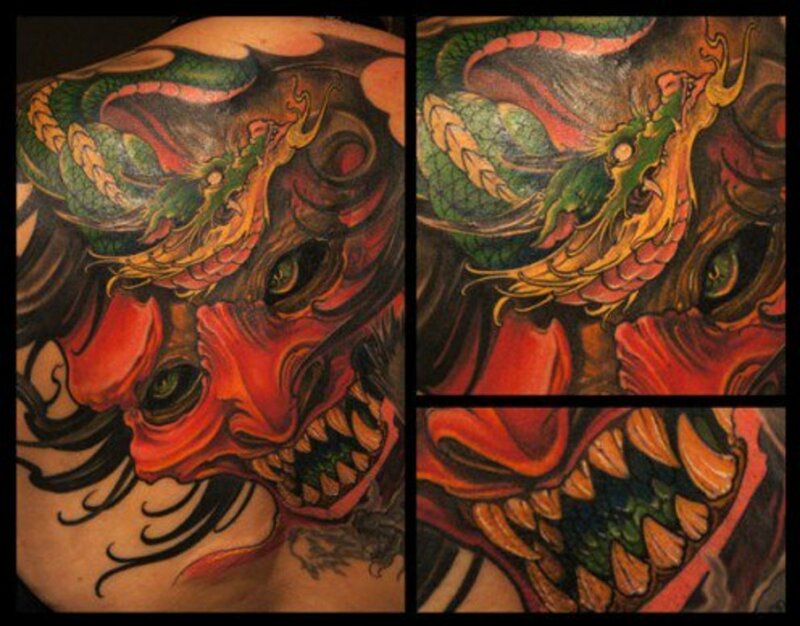 Another way tattoo artists are getting creative is by merging the skull or a woman's face to the Hannya mask. Legend has it that the Hannya was a beautiful woman who morphed into a grotesque demon due to jealousy, hatred, and vengeance. As they say, "hell hath no fury like a woman scorned." The most common story is that of a beautiful lady, Kiyohime, who fell deeply in love with a monk. Because she was unable to receive love in return, her heartbreak and negative emotions transformed and contorted her expressions into scary and exaggerated forms. Her painful expression portrayed both rage and misery. The monk was so frightened by her face that he ran towards a shrine and hid under a large prayer bell, which further infuriated the Hannya. When she found him cowering underneath the bell, she blew fire at it, effectively melting it and burning her lover alive. Her action sealed her own fate as a demon. 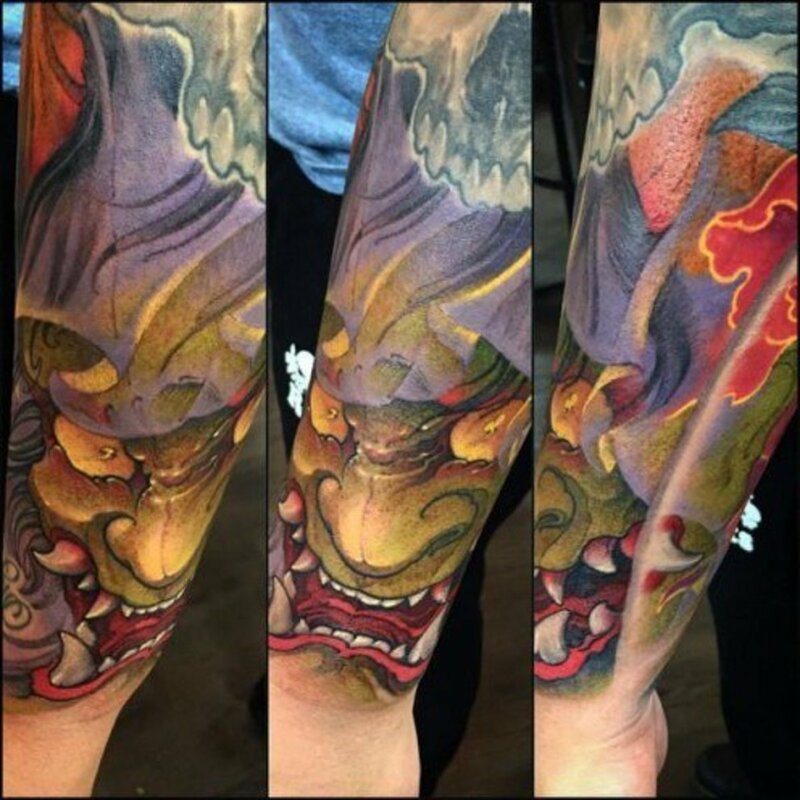 Would you consider getting a Hannya tattoo? What are the ropes on the sides of the Hennya mask? Is it used to tighten the mask? The string — sometimes with a tassel attached at the end — is used to tie the Hannya mask around the actor's head in Noh performances. Not all tattoos include the string and it's appearance is in reference to its theatrical association. @ Anahi - The string — sometimes with a tassel attached at the end — is used to tie the Hannya mask around the actor's head in Noh performances. Not all tattoos include the string and it's appearance is in reference to its theatrical association. What does the string mean? It is sometimes blurb or red and it’s always behind the hannya mask or warped around. @Sith Lord - You're right! Fixed. @ BaelRathLian - Glad that you did! Unlike nautical tattoos, I personally don't think there's any special meaning with regards to the tattoo placement. @ L.M. - Hi! Yes, this would be considered to be one — the Hannya is pretty much a female demon. Hi, is this considered a demon tattoo? Loved the article. I am wondering also if it has any meaning with the location you put it? I mean other than the details put into it. @ Larry Rankin — Thank you! Glad you felt so. Wonderful and comprehensive overview of this art form.